Draw to the air. Design new spaces. 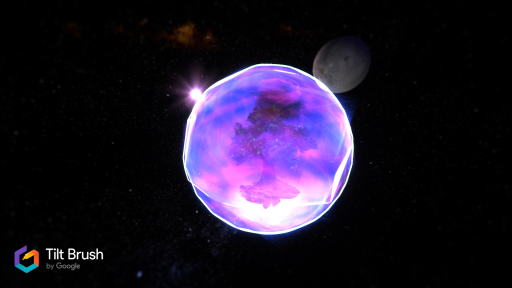 Create mini-worlds. And then walk inside your creation! Tilt Brush is a drawing and painting tool for VR. It allows you to access a myriad of tools and brushes to create spatial and immersive projects within virtual reality. Google’s Tilt Brush is fast to learn and quite intuitive to use even for the first-timers. If you are new to VR and want to experience a creation tool only virtual reality can offer, you might want to give this app a change. Even a child can use it – check out this intro video done by ”Nixy”! Let’s assume you are an interior designer working on a case of the home house interior. Or a theatre set designer constructing a scenery from the script on stage. TiltBrush is a useful tool for both of these design cases since it allows you to import the 3D-models directly from architecture-program or other VR-modelling apps (such as Sketchbox) and to draw on top of those models. This way you can sketch the interiors and place yourself right in the middle of the space you are designing. 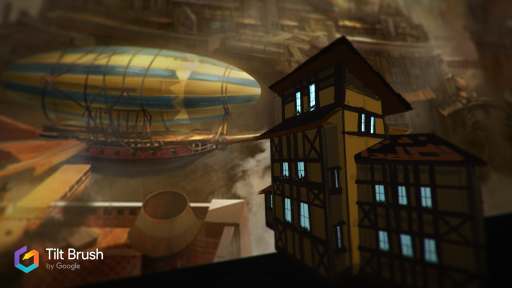 I myself have used TiltBrush for creating the set design for an immersive theatre piece. I first created a 3d-model of the performance space in Sketchbox and then imported that model to TiltBrush. Drawing on top of that model, I then sketched the interiors of the performance space where the audience would promenade freely. The different brushes of Tilt Brush allowed me to have a sense of the spatial construction within the performance as well as try different sets of colors and their effect on the moods etc. Nameless spatial art from the writer. Spatial forms of art, such as sculpting, have been around for a long time. But Tilt Brush can be used in so much more than just for creating something that is looked from outside in. The real magic with this medium lies in its ability to take you inside the fiction, to make you a wanderer inside the landscape of the artwork. This is a form of immersive art that shares some connotations to architecture, interior design, sculpting, and location-based art. 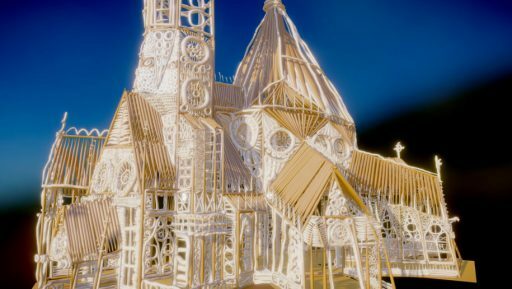 Tilt Brush allows for importing reference pictures and creating 3D-models with their help. Together with my developing team, we have used Tilt Brush for making a 3D-models for a VR game and exporting these models to the game engine Unity. If you want to adopt this workflow, here you find a good and working description of how to do it. 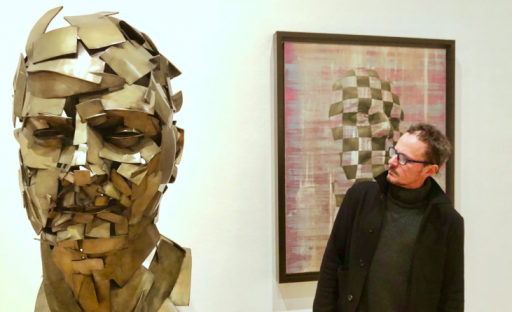 Artist Jonathan Yeo with his creation designed in Tilt Brush. Tilt Brush and other XR technologies make it possible for new kinds of work processes. Here’s an example of VR design combined with 3D printing. In this case, the end result is a piece of art the similar kind of methods could be used for any kinds of industrial design processes. Your 3D-printing dreams you can make alive in Aalto Fablab at Otakaari 7. 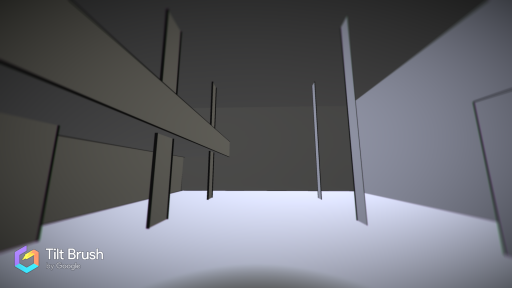 Empty walls created with Sketcbox and imported to TiltBrush, ready to be rock’n’rolled with some brushing! Let’s imagine you are making a service design for a new automatic metro. How do you design the signs and instructions so that they are visible for the passenger? Where do you place info and ad screens? For this, you can create models in another easy creation application called Sketchbox and then importing that model to Tilt Brush. I will explain this workflow in detail in upcoming post soon! To see what Tilt Brush is capable of doing, see this autistic artist creating a model of a car. Or witness how this alien has used Tilt Brush to design his shop in Google Poly library, which is a free library for 3D-models you can use in your studies as well! TiltBrush – as all the immersive apps and artworks – can be understood only through experiencing it. Visit VR hub in the Learning Centre to try it out yourself!